I refer to the article “Cheated by rogue lawyer” (ST, Aug 14). For five long years, the Sim brothers had to endure a court case and fork out hundreds of thousands of dollars just to keep their own property. Their ordeal started in 2004 when their lawyer, Sivakolunthu Thirunavukarasu, “forged their signatures and transferred ownership of a factory they had purchased to her name,” according to a report by the Straits Times (ST). “Cheated of their property when their lawyer forged their signatures to seize ownership, three brothers had to come up with another $700,000 to prevent the bank from selling off the building. On Thursday, their five-year-long plight finally ended when the High Court ordered the rogue lawyer’s name to be removed from the property title deed and replaced by their names instead”. 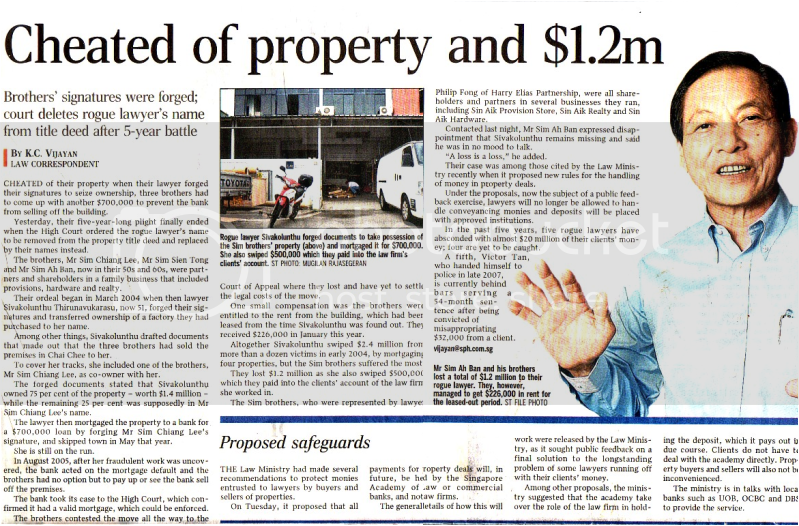 Since the rogue lawyer had forged their signatures and transferred ownership of a factory they had purchased to her name, and had also altogether swiped $2.4 million from more than a dozen victims in early 2004, by mortgaging four properties, and ran away from Singapore in May 2004, I am somewhat puzzled as to why the bank mortgagee had proceeded and continued with the subject court case all the way to the Court of Appeal over five years, when there was clearly fraud by a third party, the rogue lawyer? This brings to mind the recent furore in the media about banks insisting on holding a credit card holder responsible for $17,000 used on her stolen credit cards. In countries like the United States, consumers are well protected, and have only a US$50 liability for credit cards used fraudulently. It is also almost unheard of for customers to be pursued in the courts by banks for fraud by a third party like a rogue lawyer. The Consumers Association of Singapore’s (CASE) response was that consumers can walk with their feet, i.e. use banks that have better terms and conditions for fraudulent use of credit cards. This is once again, somewhat akin to just talk with no bite, and no action. In my opinion, it could have done some research to find out which banks give the best terms, name them, and lobby for the terms to be changed to further protect consumers. Failing which, they could also mount a campaign to boycott these banks or suggest that consumers switch banks. Corporations such as financial institutions (FIs) and telephone operators seem to take our consumers for granted – requiring customers to opt-out of services (telcos) and misleading loan advertisements (see article on bank unsecured credit at 10% when it is actually 26%). What has CASE done in this regard over the years? Another case in point is the Minibonds and structured products saga, whereby 10 FIs were only banned from selling structured products from six months to two years, when hardly anyone was buying them now in any case. In countries like the United Kingdom, a consumer watchdog organization like CASE would have come down hard on them, and insitutions have typically been fined millions of pounds in the past for their misdeeds. That is why we have always said that CASE should be independent, like those of other countries, such as the United Kingdom. In the United States, consumerism is strong and consumer advocates like Ralph Nader, would relentlessly shame and pursue corporations who take consumers for granted like what is happening in Singapore. Perhaps what we direly need in Singapore is a Ralph Nader. Strangely enough, the name of the bank is not named in the Straits Times article. Otherwise, Singapore’s Ralph Nader (if we had one) would have called for consumers to avoid dealing with this bank for mortgages or possibly everything else too. Finally, what has not giving senior citizens peak hour concessionary fares got to do with suing customers for third party fraud? Taking Singaporeans for granted! Making more profits is more important than doing what’s right for consumers!